NCP Coatings takes great pride in offering the DynaMatch™ line of high performance primers and top coats to the commercial, industrial, and original equipment manufacturer (OEM) marketplaces. NCP Coatings Inc. partners with our customers to increase production, to reduce emissions, and to lower finishing costs, making NCP Coatings Inc. your partner in coatings since 1948.
used as part of a recommended Military or OEM paint system. over aluminum and steel, offering many of the benefits of alodine and bonderite metal treatments. a recommended Military or OEM paint system. Low VOC, HAPS Free water-reducible primers exhibiting fast set up characteristics. These products provide protection to mild steel and cast steel substrates where excellent early moisture and corrosion resistance is required. N-8584 and N-5570N are low VOC, HAPS Free, high performance, water reducible primers exhibiting fast curing characteristics. This product is designed to be applied to mild steel and cast steel substrates where excellent early moisture and corrosion resistance is required. N-8521 is a 3.5 VOC, Lead and Chromate Free Primer designed for interior and exterior application to steel. This primer is very well suited for general industrial applications including heavy equipment, trailers, and trucks. Will accept many topcoats including some 2K Urethanes. N-7382IH is a 3.5 VOC, HAPs Free Black Coating designed for interior and exterior application to steel. This product is very well suited for general industrial applications including heavy equipment, trailers, and trucks. It can be used as a primer, or as a topcoat. Lead and Chrome free, Gray, Corrosion Inhibiting Primers designed for interior and exterior application to steel. These primers are very well suited for general industrial applications including heavy equipment, trailers, and trucks. Will accept many topcoats after a short dry time and can be used as a barrier coat. Lead and Chromate Free Epoxy Primers. This product is suitable for properly prepared ferrous and nonferrous substrates providing superior corrosion resistance when used as part of a recommended OEM paint system. DynaPrime™ Sealers are VOC compliant, two pack polyurethane coatings for use as a primer or sealer on metal, wood and plastics. They feature excellent wet on wet recoat ability with polyurethane topcoats. A two component, HAPS free, epoxy polyamide, corrosion inhibiting primer suited for high performance applications where corrosion resistance in a lead and chromate free product is desired. This product is very well suited for general industrial applications including heavy equipment, trailers and trucks where a high performance epoxy primer is required. 54% Zinc. N-5751M2 is an Organic Zinc Rich Moisture Cure Primer yielding 90% Zinc in the dried film. N-5751M2 is designed for use where extreme corrosion resistance is required. N-5751M2 is recommended as the first coat for equipment and machinery that require an enhanced corrosion system. N-5751M2 meets the requirements of SSPC 20 Type II and A-A-59745. A three component, HAPS free, epoxy polyamide, corrosion inhibiting primer suited for high performance applications where extended corrosion resistance is required. The product is lead and chromate free and contains 90% Zinc in the dried film. This product meets SSPC No. 20 Type II and A-A-59745. This product is very well suited for general industrial applications including heavy equipment, trailers and trucks where a high performance epoxy primer is required. This water reducible system has been designed for use as a direct-to-metal water reducible coating for application to properly prepared ferrous substrates requiring excellent DOI and corrosion resistance in a single component high gloss coating. This W/R system is lead and chromate free and is ideal for machinery and equipment manufacturers looking for a high quality finish in a single component self-priming system. An Interior/Exterior Air Dry Alkyd, intended for Farm Equipment, Metal Racking, Shelving, Machinery. 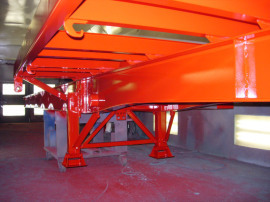 Ideally suited for use in steel fabrication facilities looking for a single component, fast drying, economical coating. N-7397/N-7399 is a high solids enamel topcoat with good exterior durability designed for interior and exterior application to steel. Very well suited for general industrial applications including heavy equipment, trailers, and trucks. N-8595/N-8596 is a 3.5 VOC Acrylic Modified Alkyd topcoat with enhanced exterior durability designed for interior and exterior application to steel. Very well suited for general industrial applications including heavy equipment, trailers, and trucks. N-8595/N-8596 Acrylic Modified Alkyd topcoats offer improved gloss and DOI over standard alkyd systems. N-7273/N-7274 is a 3.5 VOC Bake coating designed for a variety of interior/exterior metal surfaces. Commonly used in the office furniture industry. A low gloss two-component polyurethane coating that can be applied as a smooth or textured finish on metal, plastic, and wood substrates. An ideal coating for finishing products with multiple substrates or where a high performance finish is needed but high temperature curing is not possible. Available in custom colors. Intended to use on Electronic equipment and enclosures, plastic housings and parts, cell phones, medical equipment, MDF(medium density fiberboard), aluminum, iron or steel surfaces. A low VOC HAPS-free polyurethane that was specifically designed for Direct to Metal application in the Ground Support, Agricultural, Fleet, Heavy Industrial Equipment, and Marine Marketplace. It offers good color and gloss retention, as well as good corrosion resistance. N-9675A and N-9685A are a single stage 2K polyurethane system. A low VOC, low HAPS polyurethane that was specifically designed for the Agricultural, Fleet, Heavy Industrial Equipment and Marine Marketplace. AcryHyde offers excellent color and gloss retention all while offering superior impact and chip resistance not normally found in polyurethane technologies. AcryHyde is an excellent coating for the OEM marketplace looking to increase the longevity of their products in the field through coatings performance. A low VOC, low HAPS polyurethane that was specifically designed for the Agricultural, Fleet, Heavy Industrial Equipment and Marine Marketplace. N-9538A/ N-9539A offers excellent color and gloss retention all while offering superior impact and chip resistance not normally found in polyurethane technologies. N-9538A/ N-9539A is an excellent coating for the OEM marketplace looking to increase the longevity of their products in the field through coatings performance. A low VOC, low HAPS polyurethane that was specifically designed for the Agricultural, Fleet, Heavy Industrial Equipment and Marine Marketplace. N-9212A/ N-9213A offers excellent color and gloss retention all while offering superior impact and chip resistance not normally found in polyurethane technologies. N-9212A/ N-9213A is an excellent coating for the OEM marketplace looking to increase the longevity of their products in the field through coatings performance. DynaGuard™ spray on coating is a high performance polyurethane coating designed to produce a textured nonskid surface for application to properly prepared metal substrates where a superior coating is required to produce a UV, abrasion, and chemical resistant surface. DynaGuard™ is available pre-packaged in black, or for custom selected colors a clear version is available for use with our full line of DynaMatch™ colorants allowing for custom selected color matches producing the same UV, abrasion, and chemical resistant properties. DynaGrip™ N-9852A Clear Non-Skid Base, designed to be tinted with the addition of tint paste and texture additives. Flexible Polyurethane Non-Skid Coating, in a fine texture profile designed to replace adhesive non-skid tapes that are prone to delamination. DynaGrip™ offers excellent durability, color retention, and stain resistance and can be applied as is or top coated with 2K urethanes in a desired color. DynaGrip™ was designed to offer a Flexible Non-skid Coating, for applications where expansion and contraction or the flexing of the substrate may be a concern. DynaGrip™ can be either roll or spray applied. DynaGrip™ is a Flexible Polyurethane Non-Skid Coating, in a fine texture profile designed to replace adhesive non-skid tapes that are prone to delimitation. DynaGrip™ offers excellent durability, color retention, and stain resistance and can be applied as is or top coated with 2K Urethanes in a desired color. DynaGrip™ was designed to offer a Flexible Non-Skid Coating, for applications where expansion and contraction or the flexing of the substrate may be a concern. DynaGrip™ can be either roll or spray applied.